Dublin opens Luas Cross City; Skoda sold to PPF group; UK reveals ‘Transforming Cities Fund; VDV alliance for tram train orders; Thailand to launch four LRT projects in 2018; Wellington light rail to be fast tracked? ; BOX mock up tram revealed. Vic Simons sees how the most car reliant city in the US is fighting hard to build its light rail presence. Reg Harman considers three French cicites approaches to tramway development and the importance of brilliant urban design. In one of the UK’s fastest growing regions, this historic city demands better transport, argues Colin Harris of Cambridge Connect. 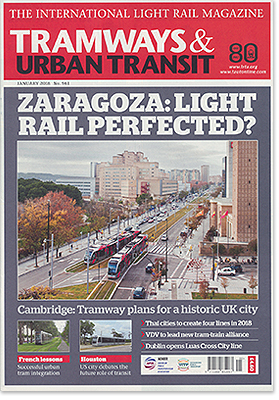 Ana Moreno of Tranvia de Zaragoza shares the benefits of the city’s first tram project. New trams, route upgrades and connections across the Danube are transforming Slovakia’s capital, as Neil Pulling discovers. Work begins on Bolivia’s first LRT line; Hyderabad metro opens; Stockholm terminates resignalling contract; Sound Transit orders Broolville Liberty ‘off- wire’ cars. Incident reponse and tram train OLE quried. Mike Russell report on new life planned for the trams of the former Kazakh capital.